This month sees the start of a new season of Midsomer guided walking tours of Thame, following their highly successful début last year. Six trained volunteer tour guides took over 200 people on Midsomer tours last year, visiting filming locations in the town centre used in episodes of the popular ITV series Midsomer Murders. Thame is one of the most frequently used filming locations, with 21 locations in the town centre alone. Amongst Thame landmarks that have been featured are Thame Museum, Market House, Rumsey’s Chocolaterie, the Spread Eagle and Swan Hotels, the Coffee House, and the Black Horse brasserie. Thame Town Hall itself has been portrayed as Causton Town Hall. Visitors can pretend they really are outside Causton Town Hall by asking at the Information Centre for a specially produced Causton sign to be hung over the Town Hall sign. Perfect for pictures to show your friends and family back home! Midsomer Murders is still going strong after 20 years, with new filming taking place in Thame just last year. Becky Reid, market town coordinator at Thame Town Council, commented, “6.5 million people watch Midsomer Murders in the UK and millions more worldwide. It’s one of the UK’s biggest TV exports, and when people see it on TV, they want to come and visit the beautiful towns and villages of Midsomer, such as Thame. While here, they spend money in our restaurants, pubs, hotels, and shops – which is good for the town and its economy”. 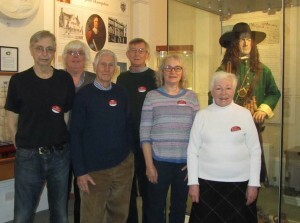 Tony Long, coordinator for the tour guides, who are all members of Thame Players, said, “This year the tours are being held on Wednesdays, as this proved to be the most popular day last year. Last year we had people from the UK and from overseas, including visitors from Germany, Denmark, Australia, and Canada. We are hoping to beat the number of tour participants this year”. Tony continued, “The more people we have coming on the tours, the more funds we can donate to worthy causes at the end of the season. Last year we donated over £360 to the Mayor’s Charities and a similar sum to Thame Museum. The guides themselves don’t take any income from the tours, and any funds left go towards admin and next year’s promotion”. Becky concluded, “These tours are certainly adding a new dimension to tourism in the town, attracting more visitors from the UK and overseas to the historic town of Thame”. The tours take place weekly until the end of October, on Wednesdays at 11.00am. They start from inside Thame Museum (79 High Street, Thame, OX9 3AE), one of the filming locations. Tickets cost £7.50 each and may be purchased online at www.ticketsource.co.uk/thamemidsomer. You can also purchase tickets at Thame Museum (open 10am – 4pm Tue, Wed, Sat, and 12pm – 4pm Sun), or simply turn up and pay the guide on the day. If the advertised tour times don’t fit in with your itinerary, tours can be arranged for groups of 4 or more people on other days. For more information, contact Tony Long at thamemidsomertours@gmail.com. An updated version of the Visit Midsomer leaflet, covering locations in Thame and in neighbouring villages is available free of charge at the Town Hall Information Centre and Thame Museum, as well as at local hotels, pubs, shops and cafes. An online version can be downloaded from thametowncouncil.gov.uk, www.thamemuseum.org or www.visitmidsomer.com. The Midsomer tours were developed from an original tour created by David Dodds, a trustee of Thame Museum. The tours are held under the auspices of 21st Century Thame, an organisation that brings together local businesses, community groups and councils to help keep Thame vibrant and viable as a market town. They began after a successful 21st Century Thame Midsomer Workshop held in Thame two years ago, which recommended a number of promotional ideas to develop Midsomer tourism in the town.